In the previous post we discussed the generalities of stops and how they can be used. We also discussed the use of stops both for loss and for profit. We discussed how each was equally important and why. In this post we are going to look at exits using other methods of establishing trailing stops. In the previous post we discussed using cycle highs and lows to establish our stops. Cycle highs and lows for stops is but one of several methods available.. Since any method to get the exit point to follow along behind price is a trailing stop, we should discuss some of those additional methods besides cycle highs and cycle lows. In the past, I often referred to these manually set trailing stops as chase stops because it required me to manual chase after price by moving my stop. Though there are methods to accomplish that in your trading platform most methods require you to physically move that stop. Each of the above would serve the purpose of establishing an exit point. Which would be best for you is mostly going to be based on preference as they pretty much do the same thing. Using the cycle highs and lows is using history to determine if price is breaking a previous point of where it turned. Support and resistance zones are much like the cycle highs and lows with the exception it generally involves several price bars to designate that zone. The Fibonacci has its own following and that is a topic all on its own and will not be discussed here. Plus or minus price spreads are straight forward in that you are simply selecting a value to restrict price from exceeding. Each of these has advantages and disadvantages which we will discuss here. The advantage of cycle high and cycle low method is that the point as very clear and require little to no interpretation. The disadvantage is that the amount we must allow from current price may be too much for some to bear. The concept is that price moves between these cycles and allowing it enough room will prevent us from exiting too quickly. However, that also means allowing a significant move before one is stopped out which may cause considerable loss of our profits. Using zones of support and resistance are very similar to using cycles but they may be a bit harder to see for some to identify them. The disadvantages of support and resistance zones, other than seeing them, are much the same as the cycle stops. This may be reason that many are using the plus or minus of price method. This price spread approach is very easy and simply uses a value to set a distance that price must move against our trade position before price stops out. This stop can be manually moved up as the bar closes and is frankly a wiser method that using automated stops. You can use your trading platform to place trailing stop exits based on a fixed amount, standard deviations or percentage of price. You can apply that against mark, bid or ask. Here is what often happens using the automated process. Since your trigger point is a specific point in price one has to consider the volatility of price. One needs to note price action in order to determine how much spread is needed to prevent premature exits and typically that is not done. That trigger point and the value attached to it is often inadequate for the fear of losing too much profit if price goes against the trade. Note the two little read arrows. 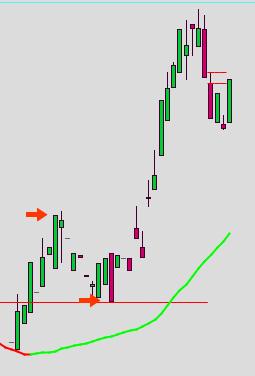 If a stop had been established to trigger off of the last price of that bar the amount would have had to be sufficient enough to prevent from being stopped out before reaching the second red arrow. Often traders just visualize that price will move happily along and when it goes against the trade for more than a bar or two it is time to get out. That may be the case depending on what you objective of the trade. However, if your objective is ride the long swings you have to be willing to ride through the retraces as you see to the left. Of course one could always exit earlier and then re-enter but that still leaves the matter of when to exit. What we have not covered is a non-traditional way of determining not only exits but it also provide an additional reinforcement for trade entries. The TW SRT is a method that plots areas of Bullish and Bearish support to clearly identify those zones that are currently active in price action. The problem with most support resistance methods is that are historical. Though that is not necessarily bad it certainly is not as good as zones defined by more current price action. Note the next graphic that depicts the same as found on the left but with the addition of the TW SRT. Note the Bearish support zone that was plotted exactly where we had determined for the charts where price continued the Bullish run. Also notice that this zone was created somewhere off of the graphic prior to price even going above this zone. Before price actually started retracing we were given the location that would determine if to exit or to continue to stay in the position. More of this is covered in the Tested Wisdom Trading Manual which can be found at the following link.